Wheebox shortlisted for Lufthansa Runway to Success Season 2! Echelon 2014. Wheebox has been short-listed as Top 27 entries from over 20,000 contestants for ET Now "Lufthansa Runway to Success" Season 2. Wheebox has been selected as one of the frontrunners for the prestigious Asia-wide startup conference, Echelon 2014. 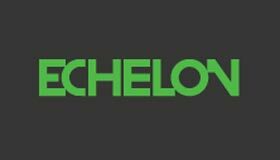 Wheebox was selected from over 400 submissions and is one of 171 startups selected to pitch at one of the 12 Satellites surrounding Echelon 2014. Startups pitching at each of the Satellites have been selected based on their technology and business innovation, as well as their market potential and interest from Asia's technology investment community. 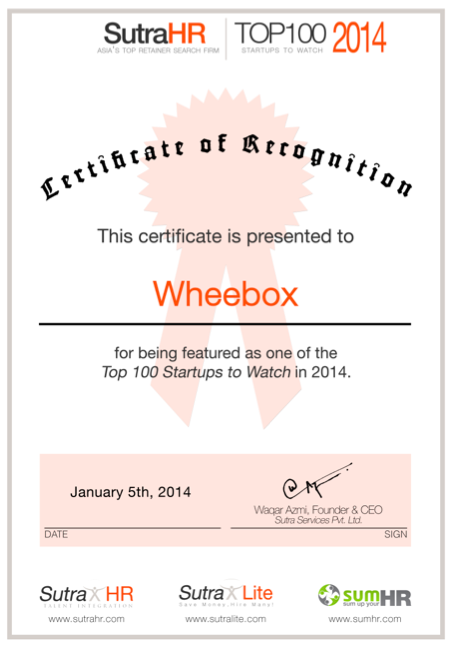 Wheebox figured in Top 100 stratums to look out for in 2014 by SutraHR. The Top 100 startups are listed base on Traction, Potential Market, Pedigree of the Team and Scalability. Amity University awarded Wheebox with "Academia Industry Interface Award" on the occasion of 14th Annual Corporate Summit held on 28th September,2012. The Summit was attended by CEOs, HR Heads and Top Managements of Government, PSUs and Corporates of India. Other Organizations who received the awards were Accenture, Ernst and Young, HCL Technologies, Indian Oil and Havels. IBM Global selected Wheebox for "Global Entrepreneurship Program" that entitles a dedicated Project Resource Manager from IBM World, No charge access to all software products from Information Management, Lotus, Rational, Tivoli, and WebSphere and exclusive mentor-ship along with advice from major international venture capital groups, corporate clients, local investors, and serial entrepreneurs. Wheebox bagged coveted listing in SiliconIndia 100 Budding Services in India for 2012. A list 100 budding services company is major feat for Wheebox assessment solutions. SiliconIndia is leading Business and Technology magazines in India and abroad. Wheebox received Red Herring Finalist 100 from Asia for the year 2011. Red Herring announced today it has selected Wheebox as a Finalist for Red Herrings Top 100 Asia award, a prestigious list ongoing the year's most promising private technology ventures from the Asian business region. Wheebox received Certificate of Nomination for "Leaders of Tomorrow", 2011 Awards, organized by Economic Times and Ernst & Young.